Saxsayhuaman, the greatest monument of the Incas, still stands, in part, above Cuzco in the Parque Arqueológico de Sacsayhuamán. Saxsayhuaman, also spelled Saqsayhuaman, Sacsahuamán and Sacsayhuaman. Saxsayhuaman consists of a terraced pyramidal form, other terracing, stone sculpting, and other ancient constructs, but is typically thought of as the megalithic zig-zag walls forming the platform mound on the plaza side. 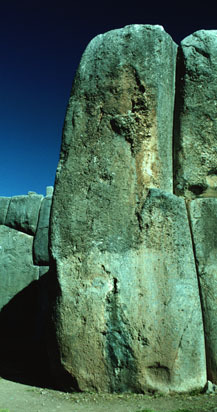 The stone resources on the Cuzco side of the monument were mined to build colonial Cuzco. A stone tower foundation remains atop the mound. The images are followed by some ethnohistorical information about the site. Each photo is a link to a larger version of the same photograph. The background image derives from Squier. View of the terraces of the Saxsayhuaman pyramid from the plaza. The opposite side faces the city and was robbed of stones for construction of the cathedral and numerous other buildings. Close up view of the cyclopean polygonal masonry of the lower terrace on the plaza side of Saxsayhuaman. The terraced pyramid mound is over 1000 feet long and was the supreme monument of the Inca civilization. The views above show only a small part of the walls on one side. Mit'a service required all males to contribute time to state projects. 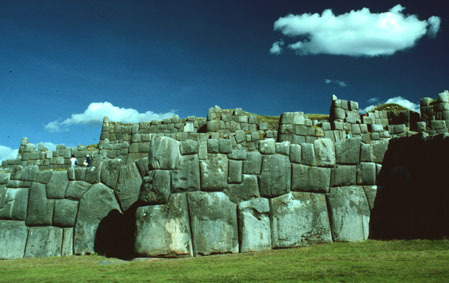 Roads, irrigation systems, terracing and great monuments like Saxsayhuaman were constructed under the mit'a system. The Incan tradition of fine masonry may have originated in the Lake Titicaca basin area. The Incas advanced stone masonry architecture beyond the works of their predecessors. 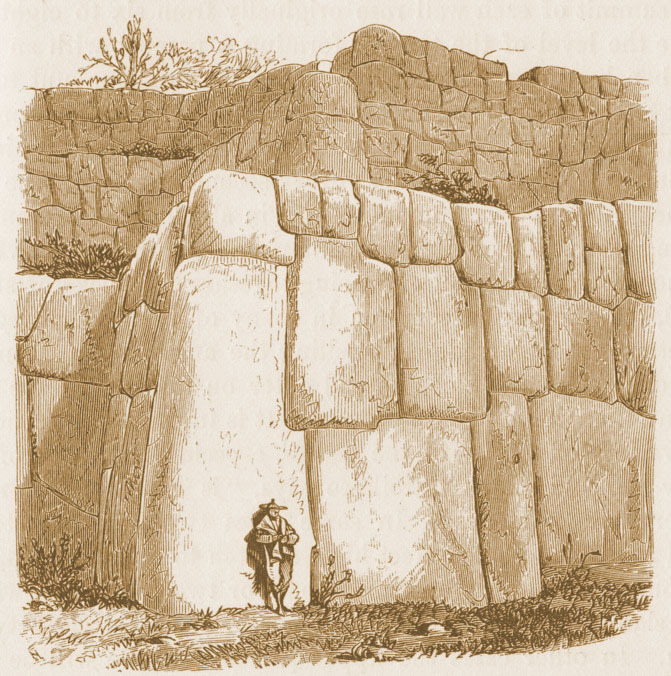 The largest Inca polygonal masonry block forms the corner of the saw-tooth wall of the lower terrace and weigh in at over 120 metric tons, by the most conservative estimate, 360 tons liberal estimate. Height is over 27 feet. The Pope, Simón Bolivar and numerous historic figures have visited Saxsayhuaman. After his capture in Vilcabamba in 1572 the last Inca, Tupac Amaru, was incarcerated in Saxsayhuaman. The revolutionary leader Tupac Amaru II (José Gabriel Tupac Amaru) addressed his ultimatum for the Bishop of Cuzco to surrender the city from the hilltop ruin. Today the monument is used to present the pageant recreation of the religious portion of the prehistoric Festival of the Sun called Inti Raimi. The event occurs every year on the Winter Solstice. Every day tourists from the world over admire the remarkable Incan masonry of what remains of the monument today, the megaliths too large for the Spaniards to mine them for their building projects in the city below. Right. 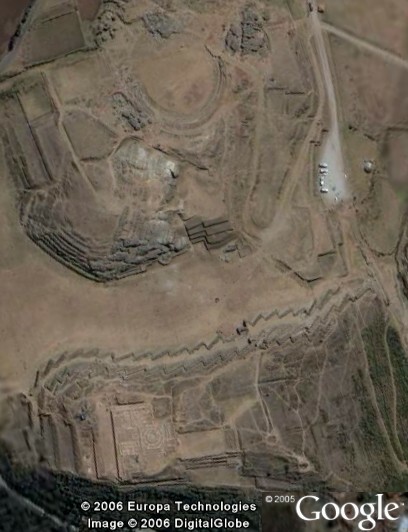 Saxsayhuaman aerial image. I was surprised to see the oval form of the Rodadero monument, near the top in this photo, on the hill overlooking the Saxsayhuaman mound. Juan Santa Cruz's colonial era drawing represented an ovoid golden image of Viracocha in the Coricancha shrine in Cuzco. One of the chroniclers who knew and wrote about Saxsayhuaman was Garcilaso de la Vega. He was born on April 12, 1539, in Cuzco, Perú, the illegitimate son of Spaniard Sebastian Garcilaso de la Vega, and an Incan princess. Garcilaso de la Vega wrote La Florida del Inca, the account of Hernando de Soto's expeditions north of Mexico, and Comentarios Reales de Los Incas. Garcilaso de la Vega reported that he personally knew that Saxsayhuaman had three towers. Excavations in 1934 demonstrated the veracity and reliability of the chronicler's account. He pointed out that the Spanish called Saxsayhuaman a fortress and that in actuality it was a Royal House of the Sun. He wrote, "la fortaleza era casa del sol" ("the fortress was a House of the sun") and "los de otros naciones no podían entrar la fortaleza, porque era casa del sol" ("those of other nations were not able to enter the fortress, because it was a house of the sun"). "...muchas de ellas están tan ajustas que apenas se aparece la juntura, y pensar cómo pudieron ajustar tanto unas piedras tan grandes que apenas se puede meter la punta de un cuchillo por ellas..."
"...many of them are so fitted that the joint hardly shows, and to think how they could fit stones so immense so well that you can scarcely insert the point of a knife between them..."
Pedro de Cieza de Leon referred to a Royal House of the Sun to the north of Cuzco, undoubtable Saxsayhuaman, built by Pachacutec. According to chronicler Diego Esquival y Navia, writing in his Noticias Cronológicas de la Gran Ciudad de Cuzco,"the construction took 77 years and was completed in 1508. It has been estimated that some 30,000 workers were employed at one time in the monument's construction. In 1559 the mining of the ruin to build the cathedral and other buildings in Cuzco began. Several years later Antonio de Gama stopped the practice. See Bibliography page for citations. NEXT PAGE IS Inti Raimi. © 1998-2006 James Q. Jacobs. All rights reserved.